The Terrible Warriors that are Mike, Steve, Julian, Cassie, Erika and Justin all sit down for some collective group therapy after the great experiment that was Paranoia XP. What did you think? Let us know on twitter at @dicewarriors and in the comments below. Loyalty is Mandatory. The Computer is your Friend. The Friend Computer thanks you for your loyalty. The Friend Computer is always watching. Oh, wow... things are not going well. Death by toothpicks? Yikes. Time to run, right? Those scrubbots are not messing around and will mess you up and promptly clean up the mess and leave a minty fresh sheen, cleanliness is mandatory. Running for their lives our team of Terrified Troubleshooters races for the Transbot transport waiting to take them to their official debriefing. Only an army of crazed murderous sanitary scrubbots stands in their way between a crazed murderous totalitarian computer ruler. What could possibly go wrong? Yea, they're all going to die this week. It's the final installment of the Terrible Warriors death waltz through Paranoia XP. The Friend Computer greets you! After a harrowing encounter with a crazed Orange officer and a bewildering trip into the bowels of the Infrared Black Market our team of intrepid Troubleshooters are now fully equipped with the information and equipment they require and absolutely nothing is confusing and nothing could go wrong. Yup, clear sailing from here citizen. Is that screaming down the hallway? 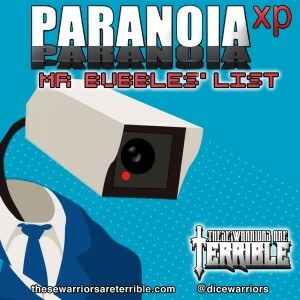 It's the second part of the Terrible Warriors trip into the madness of Alpha Complex from Paranoia XP. The Terrible Warriors have jumped into Alpha Complex as Troubleshooters! After receiving a mission from the Magnificent Friend Computer the Troubleshooting Crew must try to not deviate from their designated mission. Will they succeed? Listen to find out! ALL HAIL FRIEND COMPUTER!